Help Maggie with Lifesaving Treatement! SUCCESS! We have reached our goal in helping fund Maggie’s lifesaving treatment. Thank you for all your help! Sweet Maggie was pregnant when she was surrendered to the animal shelter. She had her two puppies at the shelter with just one surviving, and the pregnancy has made her very frail. Maggie tested positive for heartworms and if not treated now, she won’t make it. However, antibiotics and daily shots will kill all of her heartworms and give her a long, healthy life. 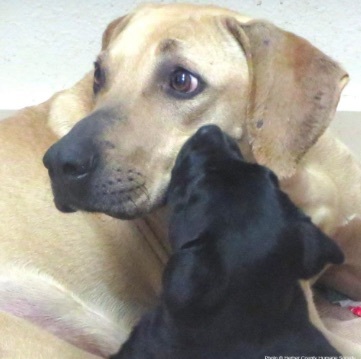 Even though Maggie struggles with her medical issues, she’s a sweet and caring mom to her 5 week old pup… and looks forward to a new and loving home!